Classes last between 2 hour at nursery school level and 3 hours for older students. Each session is organized with an activity pattern and rituals so that students remain active and stimulated. Between 6 and a maximum of 12 children participate to each class, so that each child can be constantly engaged and interracting with the teacher and his fellow students during each session. This is especially important in order to ensure that all children will be able to develop at their own rhythm, in spite of their many different backgrounds. Each class is under the responsibility of a native teacher. A supervisor and / or volunteer parents ensure global coordination and backup in the school for legal & safety reasons. As Bi-School is a non-profit, volunteer parents can be needed to ensure our teachers are always supported. A positive mindset as well as a constant care for respect and security are prerequisite for good, enjoyable and safe teaching and learning during Classes. 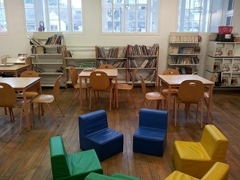 Parents, children and teachers will therefore adhere to and take care to follow Classroom Rules (Règles de Classe) as well as Safety rules (Règles de Sécurité). Classes are led by native English-speaking teachers. They are centered around work on the four competencies -Speaking, Listening, Writing, Reading- and will be made of both individual and group activities like story-telling, rhymes, songs and games. Teaching is adapted for each age group inside the class and reading / writing introduced according to the children's development rhythm, taking into account their reading maturity in French. Class themes will be mostly inspired from British or American culture (Halloween, Thanksgiving etc...) and the general tone of the sessions will be in accordance with the positive and achievement-oriented mindset proper to the English/Ameircan education. Homework can be given at the end of each class, as well as reading, so that classes are not a fire-and-forget story, but rather a weekly meeting point amidst other English-oriented activities taking place during the rest of the week.